This an open invitation to a free event in Washington, Wednesday morning, May 27, sponsored by NEHI, where I have my patient engagement fellowship. Anyone’s welcome, but a key focus is how new insurance payment models will affect cancer patients, so I particularly encourage patient voices, and especially people who are interested in how insurance plans affect patients. As alternative payment models emerge in areas like oncology, it is critical to explore the impact of these new models on patient access to innovation. The stakes are high for patients, clinicians, innovators, and the system at large. 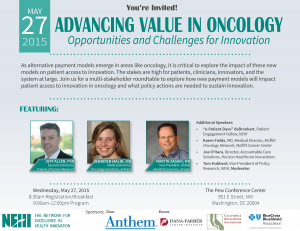 Join us for a multi-stakeholder roundtable to explore how new payment models will impact patient access to innovation in oncology and what policy actions are needed to sustain innovation. I’ll have more to say (more background information) about these payment innovations as the day grows closer. One place to start is this 90 minute webinar recording from last August. This kind of NEHI event is highly interactive. A panel of seven (see agenda page; I’m one) will hold two 75-minute discussions with much Q&A from the audience. Moderator is Tom Hubbard, NEHI’s vice president of policy research – a great guy – very knowledgeable, approachable, and personable. A learning health care system is anchored on patient needs and perspectives, and promotes the inclusion of patients, families, and other caregivers as vital members of the continuously learning care team. 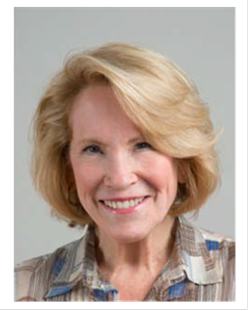 NEHI gets this: You can’t include the patient perspective if patients aren’t there. For years patient advocates have appealed to meeting organizers to have patient voices at the table – not just talked about, but actively in the discussion. If you as a patient, or your organization, is interested in this subject, register and come to this half day event. 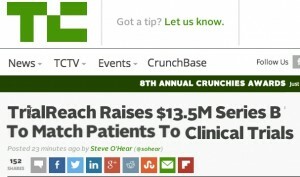 My advisory client TrialReach is on the big hot TechCrunch site today, for their success in raising another $13.5 million (here). 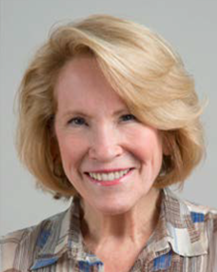 I don’t do much advisory work, but to this one I said yes, because it’s a big push forward in making vital information more accessible to the ultimate stakeholder – the patient – and it’s done in way that blends three things I’m passionate about: good business sense, modern technology, and patient-centered design.